Caption: This image was compiled using data gathered by NASA’s Aqua satellite on Sept. 3, 2010. The Arctic Ocean is covered by a dynamic layer of sea ice that grows each winter and shrinks each summer, reaching its yearly minimum size each fall. While the 2010 minimum remains to be seen, NASA’s Aqua satellite captured this snapshot on Sept. 3. 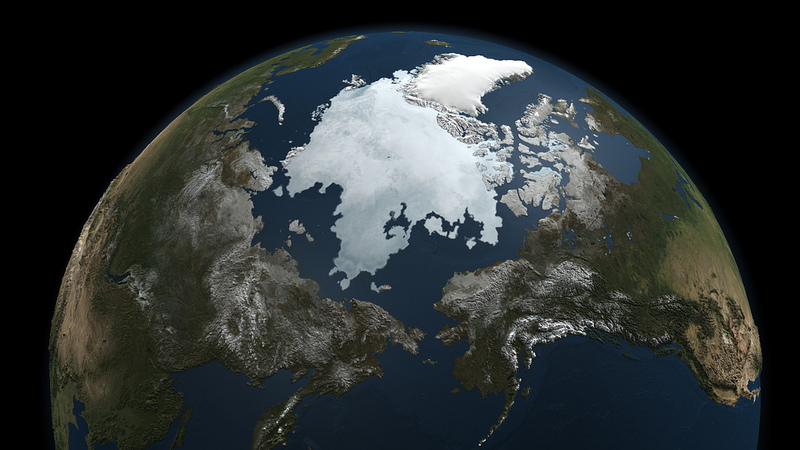 The Arctic sea ice is a major factor in the global climate system. The ice cools the planet by reflecting sunlight back into space. It also helps drive ocean circulation by converting the warm Pacific water that flows into the Arctic into the cold, saltier water that empties into the Atlantic. The sea ice also fundamentally shapes the Arctic; defining the organisms that make up its ecosystem and keeping heat from the ocean from melting the frozen tundra. In fall 2009, Arctic sea ice reached its minimum extent on about Sept. 12, and was the third lowest since satellite microwave measurements were first made in 1979. Researchers are interested in year-to-year changes, which can be highly variable, so that scientists need many years, even decades, of data to examine long-term trends. Notably, all of the major minimums have occurred in the last decade, consistent with other NASA research, which shows January 2000 to December 2009 was the warmest decade on record. As the sea ice nears the 2010 minimum later this month, look for images and analysis from NASA and the National Snow and Ice Data Center, in Boulder, Colo.
NASA Goddard Space Flight Center contributes to NASA’s mission through four scientific endeavors: Earth Science, Heliophysics, Solar System Exploration, and Astrophysics. Goddard plays a leading role in NASA’s endeavors by providing compelling scientific knowledge to advance the Agency’s mission.